April 9, 2019 – The virtual queue for the Star Wars Celebration Store shows a “pause” status as of this morning. Check back frequently so you can get in line (or online) to save yourself the aggravation of having to stand in an actual line at the onsite Celebration Store. Click HERE or the image above to enter the virtual queue. The online queue is moving like pond water. No surprise there. As slow as it is, however, this should save you a ton of time (both to enter the actual store at McCormick Place and another long, slow line to check out and pay for your items). ● Bring cash for those vendors who don’t accept credit cards. Avoid the high ATM fees and lines at McCormick Place; bring cash from home or another ATM/cash point. ● Tell USPS (or a neighbor/friend) to hold your mail. ● Bring bottled water and snacks. They will likely be healthier and cheaper than convention center food, and you won’t waste time looking for a place to eat when you can instead be eating while waiting in line for your next panel. ● Health essentials: hand sanitizer, lotion, lip balm, aspirin, medicines, etc. ● Sales tax is high at 10.25% (Illinois sales tax is 6.25%, Cook County is 1.75%, Chicago is 1.25%, plus a 1% “special tax”). So consider purchasing essentials in your home state instead. Also, there is a coat check for your coats, bags and other small items for a check fee of $3 or $4 per day. ● Protective sleeves for your autographs and photo-ops. ● For overseas travelers: Scan and email yourself a copy of your passport and ID cards – in case you lose the originals. Or print a copy. Makes replacing them that much easier. ● Avoid using a debit card in case you are hacked. A credit/charge card offers much more protection. Also, do you really need an RFID-blocking wallet? Slate.com says “No”. McCormick Place is North America’s largest convention center. Star Wars Celebration will be held in the West Building and, for large panels, in the WinTrust Arena. Note the main entrance at the West Building of McCormick Place. Additional entrances will open later in the day after the first surge of attendees has been screened. Visit McCormickPlace.com for more information regarding directions, parking options ($36 prepaid per day!) and public transportation. The closest CTA (Chicago Transit Authority) station, Cermack-McCormick Place on the Green Line, is within walking distance. Estimated walk time is about 8-9 minutes for the one mile walk on East Cermack Road. The most budget-friendly option is public transportation. Visit the CTA’s (Chicago Transit Authority) planning site to help navigate from point to point. The CTA site also lists current fare prices. In short, a single-ride disposable “Ventra Ticket” (bus and rail) costs $3.00. A single-ride bus-only fare is $2.50. A 1-day unlimited ride (bus and rail) disposal Ventra Ticket is $10.00, good for 24 hours from time of activation. A 1-Day CTA (Chicago Transit Authority) Fun Pass costs $10.00 and a 3-Day CTA Pass is $20.00. A 7-day unlimited CTA Pass is $27.00. You can research these and other fare options at this link HERE. A lot of hotels are on or near Michigan Avenue. Taking the bus (especially bus No. 3/King Drive) is oftentimes faster than taking the “L” – and there’s a convenient bus stop just steps from the main entrance to McCormick Place West. Use Google Maps to find your bus stops. A separate and free bus shuttle service is being offered between McCormick Place and certain hotels, mostly in the upper Loop area of Chicago. However, pick-up and drop-off times and frequency might not work for some people’s schedules. Find details at StarWarsCelebration.com. And if you’re thinking of driving a car, think carefully. Besides heavy morning traffic and sometimes bad driving weather, parking is very expensive. Even for those who have prepaid to use a lot at McCormick, stories are rife of later-arriving drivers looking fruitlessly for a parking spot, only to end up driving elsewhere. Public transportation will be kinder on your nerves and wallet. NOTE: Some of the prices in the above 2012 video have increased. Of course it will be chilly and sometimes windy. It’s Chicago in April! The average high is 56° F (13°C) and the average low is 43° (6°C). Bring your umbrella and extra shoes as the unpredictable weather averages 9 rainy days in April. And listen to your mother: “Dress in layers“. Freezing outside might be too-warm inside, so you can remove or add clothing layers as necessary. Click HERE for a daily or 10-day weather forecast. Sunrise time is 6:17 AM and sunset is 7:27 PM (April 11th). For those who have booked multiple autograph and photo-op times with your favorite Star Wars celebrities, do not panic if the schedules seem impossible. Yes, it’s common to have conflicts and overlapping autograph or photo-op times. There are 61 celebrities, after all. While trying to get from one celebrity to another (plus the endless lines) may seem stressful, breathe in and out … and relax. If you miss an appointment, you can always get in line for a later time or another day. And if you still miss a celebrity and it’s not your fault, Topps will provide you a refund after the convention is over. If you have a double- or triple-autograph conflict (e.g., three celebrities all within 30 minutes of each other), a good strategy is to get in line as early as possible; choose the celebrity with the shortest line (oftentimes the less popular signers); and if you are in a high priority group (1 or 2), sometimes a ReedPOP volunteer will walk you near the front of the line before lower-numbered groups if you explain your predicament. Ask nicely. Sometimes this works, sometimes it doesn’t. Relax. As for photo-ops, the lines move very quickly. You might just have 10-15 seconds to pose with the celebrity before a professional photographer. So your photo-op reservations should take priority over most all autographs since the overall time-window is small. By contrast, autograph lines are slow-moving and you can always join the end of a line. Click HERE to see 2019 Autograph and Photo-Op prices. To compare the Celebration Orlando 2017 autograph prices, click HERE. 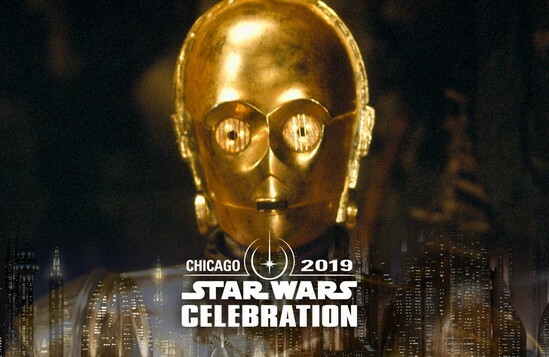 April 6, 2019 – If you like scavenger hunts and free patches, then a fun tradition awaits you at Star Wars Celebration Chicago. Various Star Wars fan clubs and podcasts are giving away a limited number of ultra-cool patches. While some are single stand-alone patches, many others are individual pieces which – when combined with others you have collected – form a super-patch picture. Eight regional Star Wars fan clubs are each offering separate patch pieces at Celebration Chicago. Once assembled, the eight patches form a picture of a vintage “Return of the Jedi” 8-figure multi-pack sticker. The patches are free, and some are easier to collect than others. You will need time and persistence to track them all down, but it is do-able. So how do you find the patches? The above six-piece patch set is inspired by artwork from the “Star Wars Droids” (1985) cartoon series, which ran for only one season with 13 episodes. Recommend selecting a patch-set you really want to complete. A focused strategy is better than running helter-skelter and ending up with incomplete sets for 3 or 4 different sets. Once you complete your high-priority set, you can always scavenge for other patches. Optional: If you have time beforehand, visit each sponsor’s website or social media page (Facebook, Instagram, etc.) to learn each club’s rules and hours of distribution. Obviously, most people won’t do the research, but it helps. Some sponsors will simply give away a certain number of patches on the hour, say 15-20 every hour, or they will conduct a raffle, and you must check a pinned board regularly to see if your number was drawn. Other sponsors will have a game or contest of skills, such as dice rolling or Star Wars trivia questions, in order to win. Still others will have individual club members roaming about, or in an assigned meet-up room, where you can collect a free patch. To commemorate the 20th anniversary of “Star Wars: Episode I – The Phantom Menace” (1999), five fan clubs and podcasts are each giving away a separate patch. The sixth patch will be distributed randomly. TIP: It’s not unusual to end up collecting doubles or more of the same patch, even by accident. Keep the extras so you can trade for patches you missed. Also consider bringing other swag or your own patches with you – these, too, can be traded with other scavenger hunters and an occasional sponsor. Besides trading with others while standing in a scavenger booth line, head to Room W476 (4th floor), the Collecting Track Social Area mentioned above. In that room you can trade patches, meet Collecting Track panelists, or just relax and catch your breath. And if all else fails after five days, you can buy your missing patches on Ebay. But what’s the fun in that? At Celebration Orlando in 2017, this 6-piece patch set was hugely popular and fun to collect. Celebration Orlando 2017: The massive Republic Gunship patch ensemble consists of 12 patches. When assembled together, the combo measures 21″W x 12.9″H. Celebration Europe (London 2016): Three patches combine to form this scene of Rey, BB-8 and Kylo Ren set against London’s Tower Bridge in the background. April 2, 2019 – Anthony Daniels (C-3PO) has been a perennial attendee appearing at nearly all Star Wars Celebration events. Join him (Anthony Daniels) on Sunday at 5:15 p.m. as he presents “Droidography” on the Galaxy Stage, an hour of personal stories, hilarious wit, and an unforgettable in-person experience. Expect the unexpected as Daniels has a marvelous time, sometimes at the expense of unsuspecting audience members. Anthony Daniels will be available in room W190 (first level) to the west and past the Pod Cast and University stages. Expect a very long line. Unlike the 61 other celebrities who will be set up in the Autograph Hall section for autographs and photo-ops, Anthony Daniels will be ensconced in his own room. Why the different setup? The rumor is that Mr. Daniels was highly displeased with the way Topps handled the autograph and photo-op procedures two years ago at the last Celebration event in Orlando. For those who have ever met the actor behind the golden droid mask, you know that he is very procedure-driven and very precise. By reserving a room for his own meet-and-greet with fans, Anthony Daniels will have better control over the manner in which he interacts with fans. An even bigger bonus: He gets to keep a larger percentage of revenue generated from his autographs (no sharing with Topps) and, we hope, the selfies with fans will be at no additional charge – just like the good old days. March 29, 2019 – Well, that didn’t take long. For customers residing beyond North America, the available inventory of the 4-foot-long Jabba’s Sail Barge sold out within 12 minutes of listing. Hasbro’s Ebay Store went live yesterday, March 28th, at 3:00pm EST / 7:00pm GMT and ended at 3:12pm EST when the last order was accepted. All 400 units of The Khetanna for overseas customers were sold out on Hasbro’s Ebay store within 12 minutes. Hasbro did not change the original list price, which was $499.99 USD when first offered last March, 2018, to U.S. and Canadian customers. Unlike North American buyers who received free shipping, however, an international shipping charge was added for buyers in Australia, Austria, Belgium, France, Germany, Hong Kong, Italy, Mexico, the Netherlands, New Zealand, Portugal, Spain, and the United Kingdom. Even with an additional shipping charge of $135.39, Hasbro’s offering is a relative bargain compared to the secondary market. Perhaps the biggest surprise was the low inventory. Some observers had speculated that Hasbro had produced about 1,200 “extra” Sail Barges – over and above the 8,810 units sold to U.S. and Canadian consumers. Instead, sales were limited to only 400 units. No further sales are expected from Hasbro of its largest Star Wars vehicle ever produced – not at retail, not online and likely not ever again. March 28, 2019 – An expanded smoking ban will go into effect at Disneyland (Anaheim, California) and Walt Disney World (Orlando, Florida) on May 1, 2019. Guests who wish to light up will no longer find designated “smoking zones” within the theme parks. Instead, they must exit the parks beyond screened security and go to designated smoking areas. In addition to a ban on traditional smoking (cigarettes, cigars, pipes), new rules will also prohibit the use of all electronic cigarettes and vaping products within the theme parks. The ban in California includes not only Disneyland and Disney California Adventure, but also the Main Entry Plaza between the two parks as well as the Downtown Disney shopping district. The ban in Florida will encompass all four Disney theme parks, Disney’s two water parks, the regular and miniature golf courses, and the ESPN Wide World of Sports complex. But at Disney Springs in Orlando, smoking will still be allowed within designated smoking areas. While California permits the sale and use of marijuana, it is still banned in all forms at the Disneyland resort. Florida has approved medical marijuana, but it too is not allowed on any Disney property. The smoking policy will not change at Disney’s resort hotels, all of which are already designated as smoke-free. Each hotel property has a designated outdoor smoking area. Also effective May 1st will be a ban on double-wide strollers. Strollers must measure no more than 31 inches wide and 54 inches long. The previous width allowed was 36 inches. The 5-inch reduction means no more side-by-side seating for your children. However, tandem strollers (one seat in front, another behind) will be allowed if the total length is 54 inches or shorter. The new rules also ban the use of accessories that are attached to strollers or electronic conveyance vehicles (ECVs), such as stroller, glider boards, or trailers. An existing, written policy already exists prohibiting wagons, but it has rarely been enforced. However, starting May 1st, the existing and new policies will be enforced at the guest screening and security tents. Visitors who arrive with an oversized stroller, prohibited accessory item, or stroller wagon will be asked to return the item to their vehicle or hotel room. Visitors can elect to rent from Disney a tandem stroller beginning May 1st. The new rules on strollers and no-smoking are driven, in part, by the expected surge of crowds when Star Wars: Galaxy’s Edge opens May 31st at Disneyland and August 29th at Walt Disney World’s Hollywood Studios. The elimination of smoking areas within the parks and a reduction in oversized strollers will free up more space within often-times crowded pathways.